Supt. Eddit Johnson speaks after another violent weekend in Chicago. Nearly 60 people were shot in Chicago over a violent weekend in the city that saw half a dozen killed, according to police. At least six people were killed in the violence, with five of the fatalities reported on Sunday, authorities said. Four of the victims killed Sunday were teens, including a 17-year-old boy who was discovered lying behind a residence just after 6 p.m. in the 7300 block of South Claremont. Shot Spotter technology alerted police to the shooting, and when they arrived on scene, they found the teen unresponsive. He was pronounced dead at the scene, and Area Central detectives are investigating. Just three hours earlier, another teen was shot and killed in the 4000 block of South Calumet Avenue, police said. The 19-year-old was leaning against a car and talking to an acquaintance when another vehicle pulled up and fired several shots, striking him in the head. The teen was taken to an area hospital in critical condition, and was later pronounced dead. Around 11:45 p.m., police discovered the bodies of two teens in a Far South Side field. Both bodies were found with gunshot wounds and were pronounced dead at the scene. The identities of the victims weren't immediately known and it was not immediately clear how long the bodies had been at the location. Officers said shots were detected in the area where the bodies were located a few days earlier. Two teens were reported missing from the area Friday, but police said it was not known if the bodies found were those of the missing boys. Sunday's first fatal shooting occurred in the 4600 block of North Clifton just after 8 a.m., when a 33-year-old man sitting in a vehicle was shot several times. The man was pronounced dead at the scene. On Saturday evening, the weekend’s first fatality occurred in the West Englewood neighborhood. Around 8 p.m., 26-year-old Matthew Hudson was found lying on the sidewalk with a gunshot wound to his back, and he was later pronounced dead at Christ Medical Center in Oak Lawn. At least 17 people were injured in shootings throughout the city Saturday and another 18 were hurt on Sunday, authorities said. On Friday evening, at least 18 people were reported injured in shootings, including seven in a mass shooting in the 1600 block of West 65th Street, according to police. Six of the victims were sitting on a sidewalk when shots rang out, and all were transported to area hospitals. A seventh victim was sitting in a backyard when she heard the shots and suffered a graze wound. No one is in custody in connection with the shooting. 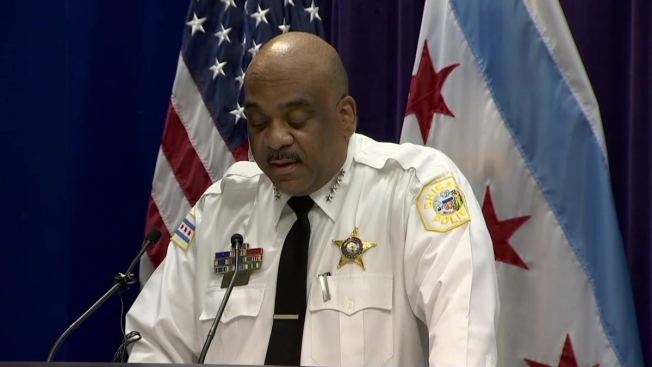 "It's no secret we had another unacceptable violent weekend," Supt. Eddie Johnson said Monday morning. He called the shootings "tragic, senseless and cowardly." Three persons of interest were taken into custody in connection with weekend incidents, Johnson said. Of the 59 people wounded by gunfire over the weekend, 26 were "known to CPD through arrest or criminal history," he added.